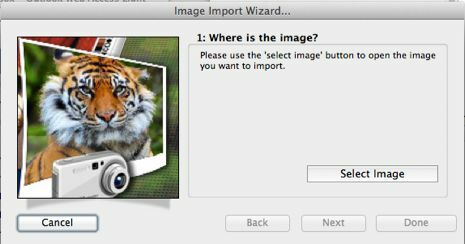 Ways to import a photo. How can I import a photograph? How can I improve the results when I import a photo? Why don’t you have an idiot’s guide to importing on your web site? It’s easy, and yet it can be tricky. Before we get to discussing the importing of a photo, we’d like to give you an analogy. Anyone can paint. Get a canvas, get some paint, apply one to the other. Now you have a painting. Buy a guitar, learn 3 chords, play them in order. Now you have a song, but is it a good one? The analogy applies to converting pictures too. You can import a picture with about 4 mouse clicks, but once it is imported, will it be good enough, or could you do better with another try? Important: This deliberately shows a bad attempt first, then talks about ways to do better. When our application opens, one of the options on the ‘landing page’ is the Image Import Wizard. Thats a good place to start, so click that button. Use the 'Select Image' button to open an image you have previously saved on your computer. The image you chose will be shown, and the dialog now shows options that allow you to set the size of the final cloth. Here, for the purposes of demonstration, we have selected a dark image, where the subject is only part of the whole. Drag the slider for cloth until it shows the correct holes-per-inch for the cloth you intend to use. Then drag the large slider control until the sizes shown are correct for your finished cloth. 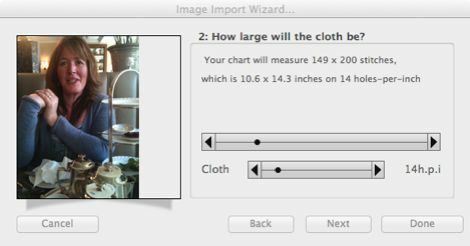 For example, if you are using 14 hpi cloth, and want a finished piece measuring 6 inches or less, drag the large slider until the dialog shows '...which is 6 inches ' or smaller. 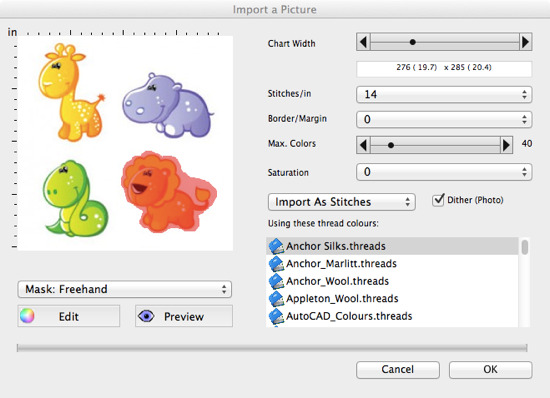 Now, select the number of different thread colors that the program is allowed to use. You can choose between Photo and Clip art. 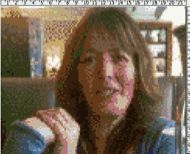 Photo will use dithering to give a more realistic image. Clip art tries to keep colors solid. Select your preferred thread manufacturer. After a short wait, a new design window will open , containing your imported image. ..and it is clear that the image was too dark and too small to make a good result. So, how can this be improved? 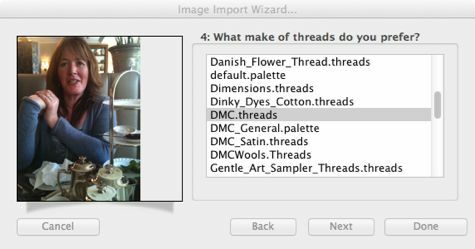 The advanced image import option has lots of options that help here, but for this page we will cover only what is possible in the Image Import Wizard, which is quick but not as flexible. The face is only a small part of a larger image. So when deciding what colours to apply to the conversion, a lot of our available range is being used up to draw background and unwanted detail, such as the table and the plates. Step 2 is to increase the brightness and contrast a little. This can be done using most image editors. So by removing the background, we have allowed more colours to be used for defining the face, and the face occupies the whole frame, which means more stitches , and therefore more detail. So , the moral is: it pays to experiment, and do not settle for the first thing you try! 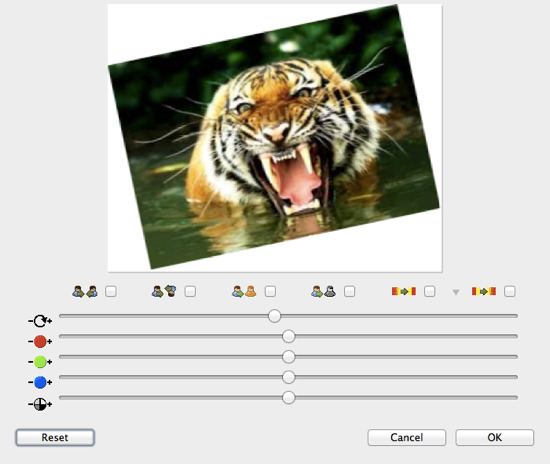 Using Advanced Image Import, you can also browse your computer for a saved picture, and turn it into a chart. This can be a photo or clipart, in any format that your computer understands. Additional formats are available if you have the most recent installation of Apple’s QuickTime. As an alternative to browsing your computer, you can import an image that has already been copied to the clipboard. If you select preview, any changes you make to the other controls that will affect the design will be displayed. (this can take a few moments). So the preview shows what you end up with. You will see that the reduced number of colors in the preview screen makes a big difference to the design, as does the size. 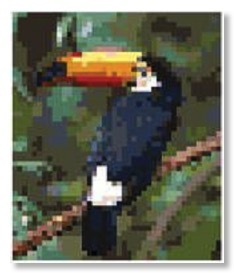 For instance, if you take the image of the toucan shown here, and import it using the default palette, which only has a fixed range of colors, while reducing it down to about 40 x 40 stitches, the result will be much blockier. you can tweak how much red, green, or blue the image contains, or adjust the brightness. .. and the Reset button reverts the image back to the original state. You can use the mouse to select an area of the image only―to crop in to someone’s face, for instance. This is a quick way to do most of the background removal you will want to do for a photo. Drag the arrows until you have selected the correct area. Use the mouse to draw all around the area you want to keep. When you release the mouse, your selected area will be shown selected in red. If you make a mistake, just click and start drawing again. 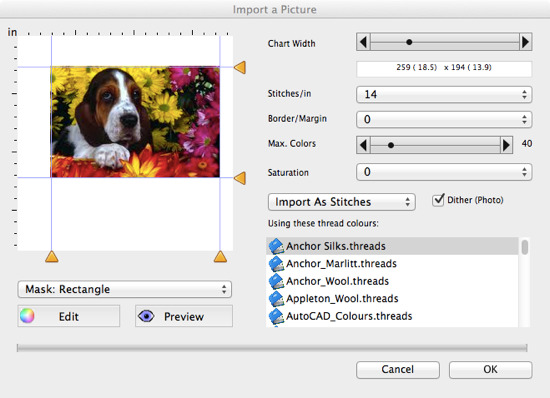 At the top right of the dialog, you can set the final stitched size of the imported image. Slide the controls for width until you have the cloth size you want. The values are affected by the holes-per-inch setting below. As you change the size, a grid around the image will also change to show the sizing. If you choose a value here, the imported image will appear on a chart that has a blank border around it, of the size you choose. This governs how many different threads the program is allowed to use to represent your image. It is usually best to allow many colors initially, and reduce them manually afterwards, as too few colors here will result in a blotchy image. If you import using a .THREADS file, this slider governs how many threads the program is allowed to ‘buy’ to complete your chart. 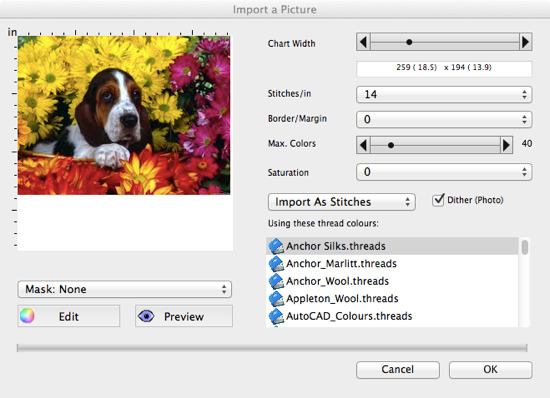 Tick this box if you are importing a photograph, as it will make a more lifelike image. For clipart and other sold colour pictures, leave the box unticked. Importing an image tends to make the colours slightly duller. The saturation option makes the image colours deeper and more vibrant. Any value greater than zero makes the colours stronger. Negative numbers make the image paler. The program is shipped with several ranges of manufacturer’s threads. Choose the one you prefer from the list. The program will choose threads from this range, up to the maximum number you select. Importing can also be done using a palette you have previously saved. If you choose this option, the image will be mapped to the closest colors that can be found in the palette. By request, this feature allows you to import the image and turn each pixel into a bead of some color, instead of a full stitch. 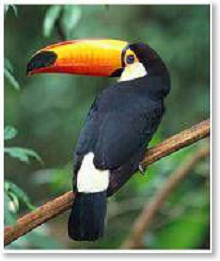 Photographs contain millions of dots of color to give you the best possible printout or view on screen. Even one that is 6 inches across can be expected to have thousands of pixels in each direction. Cross stitching is a much coarser medium, that does not strictly lend itself to representing photographs. 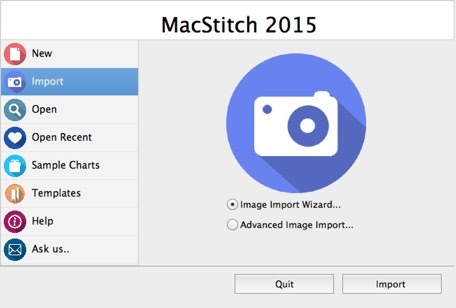 Each inch of cloth has perhaps 10 to 20 stitches to use, and it is obvious that for every 1000 pixels in your original image, you may be able to stitch a single stitch. Lots of detail will be lost. 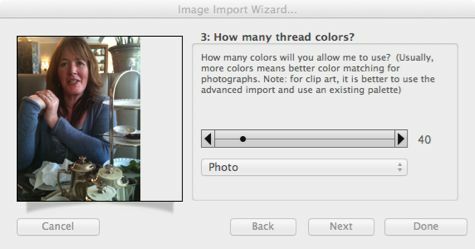 Similarly, your photo has millions of different colors, but you need to stitch the picture using perhaps 45 different thread colors. So lots of shading will be lost. To compensate for this, your image needs to be bright and punchy. Don’t waste thread colors on a busy background. 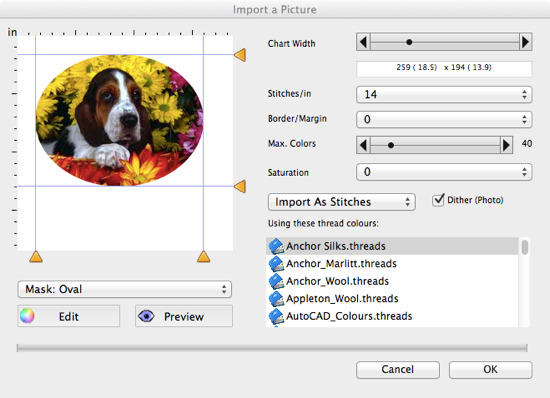 Crop your image so that what you can see is mostly what you want to stitch. If the background is ‘busy’ then it will need to be erased. Use a mask to eliminate most of the background. Then after importing, remove the last edges. Using the freehand mask tool will remove a lot of unwanted background, but if you find there is still a lot to remove, the best way to do this is to switch to erase mode, and draw rectangles around the image. When most of the background has been removed, switch to ‘single stitches’ mode, and remove individual stitches to finish the job.